I can never start a benchmark. Be it on my wifi or 3G. I even tried vpn, but no luck. 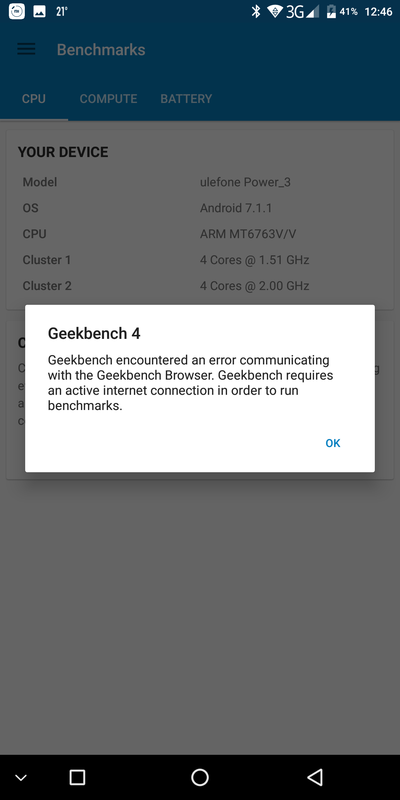 Whenever I try to start a benchmark it says there was en error. Same error message, doesn't work on data connection nor wi-fi. My apologies for the delay in getting back to you. 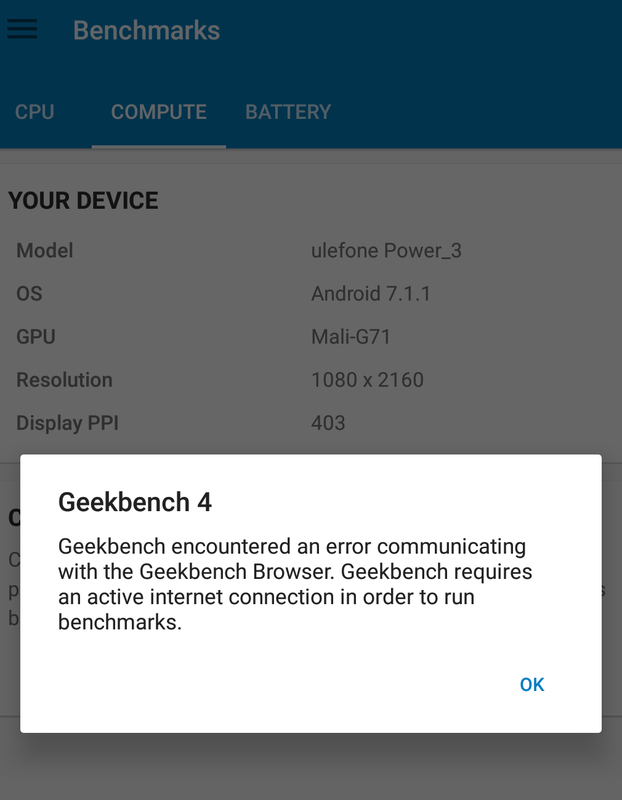 There is currently an issue with LG phones connecting to the Geekbench Browser. We are working with LG to resolve this issue, which will require a system software update from LG. Again, my apologies for any inconvenience this is causing. As soon as we have more information, we will let you know. Thanks for letting us know about this, and I'm sorry for any trouble caused by this issue. Could you let me know if this also occurs when you're running the Compute benchmark? 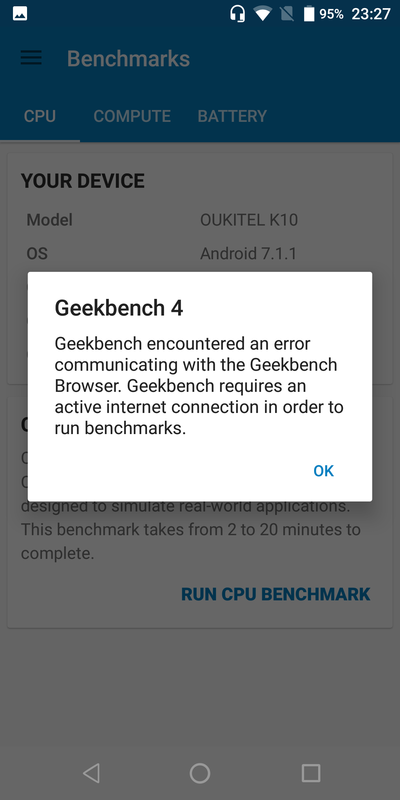 You mentioned that this occurs on all Oukitel smartphones -- if you've had difficulty running a Geekbench 4 benchmark on any Oukitel devices other than the K10, could you let us know which devices you've tested and what versions of Android and Geekbench 4 they have installed on them? 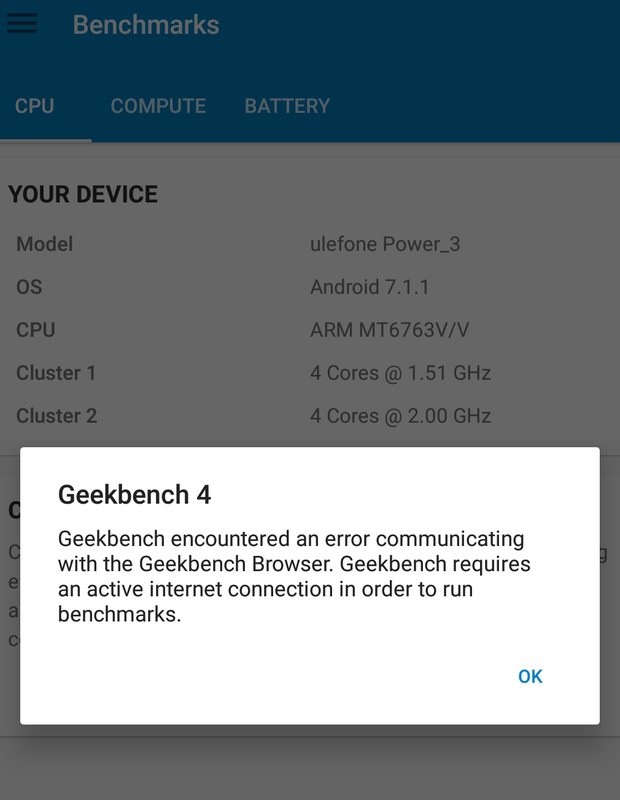 To make sure that I understand correctly, do you mean that Geekbench 4 benchmarks worked on other versions of Android on the same devices? 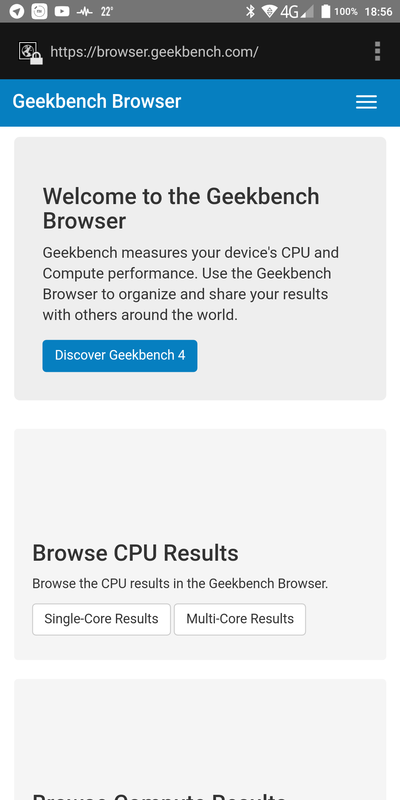 Lastly, are you able to access the Geekbench Browser (https://browser.geekbench.com) through your device's default internet browser? Yes the same error on menu CPU compute. 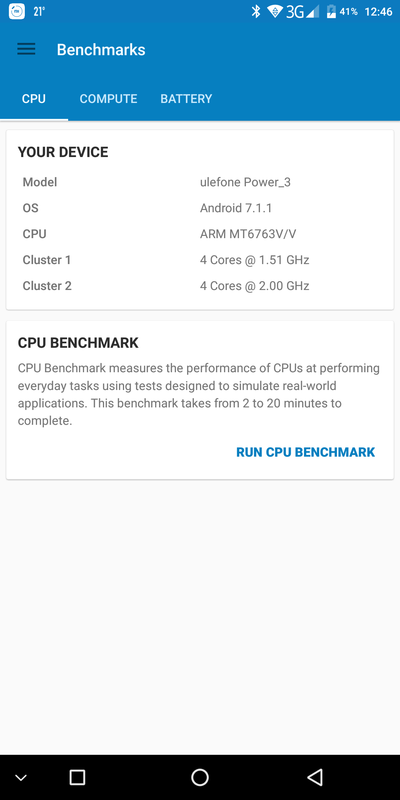 Yes the device K6 of Oukitel with Android 7.1.1 and the SoC MT6763. No problem, this link works fine onto devices. I see, thank you very much for the additional details. 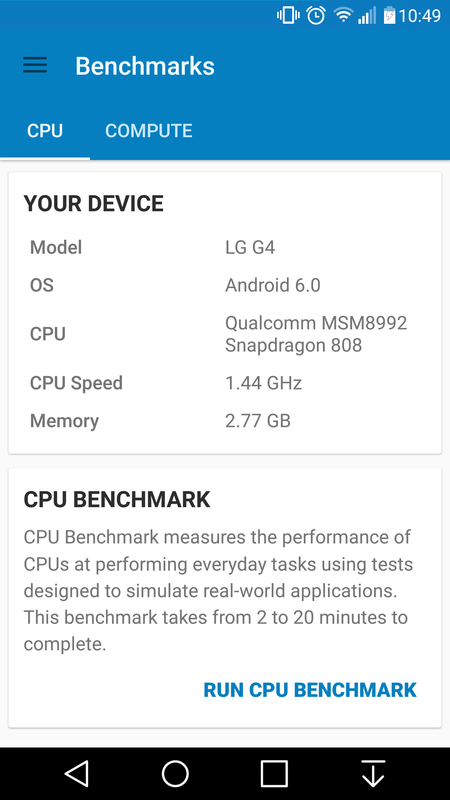 I'll pass this information along to my team for more investigation, and see if we can resolve this issue in a future Geekbench update. What about that problem ? 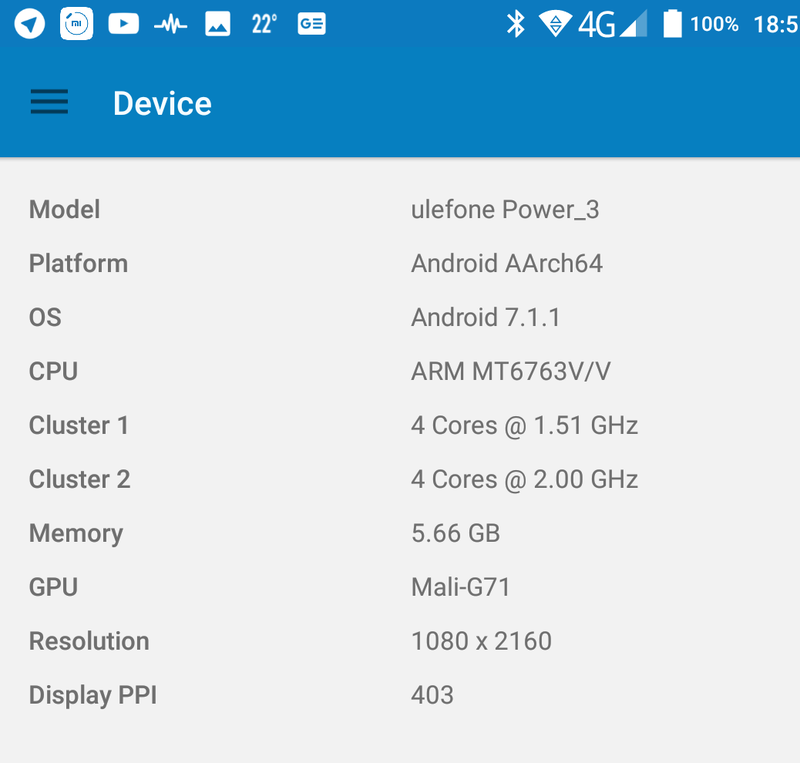 I have a Ulefone power 3 (Mtk 6763) and newest Geekbench and problem still exist. Thanks for letting us know about this. 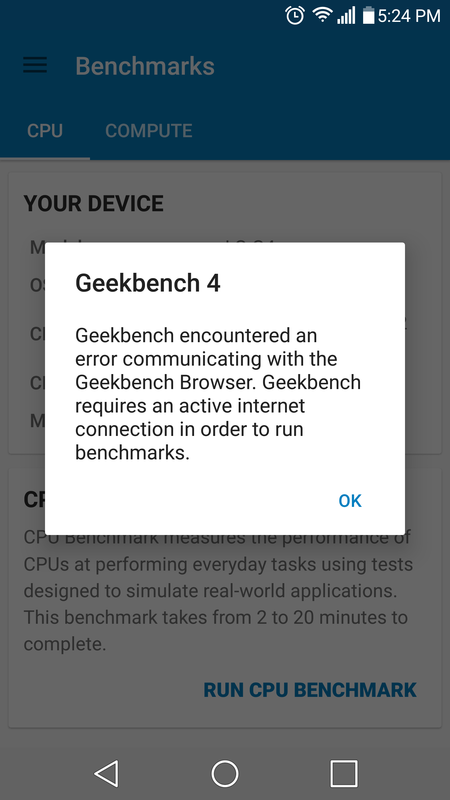 Could you let me know if you're able to access the Geekbench Browser (https://browser.geekbench.com) on your device's default internet browser? 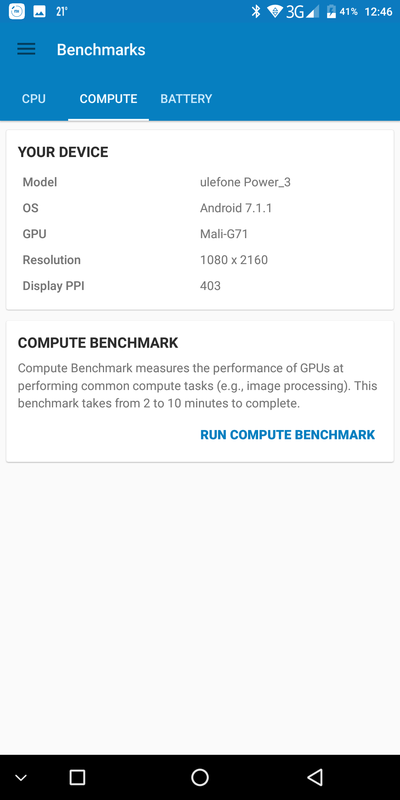 To confirm, does this occur for your device on Geekbench 4.2.3 with both the CPU and the Compute benchmarks? On all browswers (included default) i can access your page. And on both cards I have a net error. And browswer with your page. I see, thank you very much for the additional details. I'll pass this information along to my team for more investigation, and let you know as soon as I can if we can provide more information or address this issue.